Two people just happened to be looking in the ‘wrong’ direction at the same time, making it seem there was more happening. The Soweto Derby at FNB Stadium on Saturday may have produced a drama-less drawn scoreline after the match ended with a draw, but attendees definitely gave the Twitter streets something to talk about. A video clip of a couple and another man left those watching the match from their TV screens wondering if the cameraman capturing the match also worked for Date My Family. 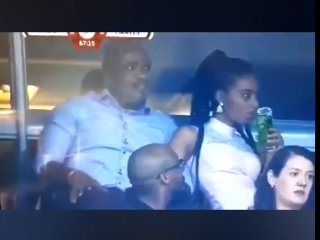 In the video that set tongues wagging, a couple can be seen in the VIP area, but what grabbed people’s attention was the man sitting in a row before them, who kept looking back, as if he was looking at the woman, who in turn gave awkward looks that left tweeps wondering if they knew each other. Twitter Derby is the one! But all was not as it seemed, and the woman took to social media to explain what was really going on. She said: “Oh we’ve now figured out what the whole fuss is all about with the trending video! “The guy in front of us was watching replay action from the screen behind us while hubby was telling me that we are on TV as he saw it from the stadium big screen. I was shocked to appear on TV with a glass of cream soda in my hand. Even sports presenter Mpho Letsholonyane explained the situation, saying the man who kept looking at the screen was there with his partner. Shame. I’m talking to him now. He’s there with his woman. Lady seated next to him. He turned to check the replay on the screen. Guess the other lady felt she was being watched and it was awkward for her. Very innocent. Case closed ??? ?